Our 1834 sqft 'Blue Coyote' townhouse is named after Keystone's infamous wolf-like Blue Coyote that roams the wetlands around the Snake River. It is a short 5-minute walk from your door to the Mountain House Lifts, but best of all, when you're the most tired, it is ski-in to the road in front of the Ironwood complex. A 35-yard walk to our private single car garage through some evergreen trees gets you to a place to rest your tired feet. If Little Red Riding Hood walks directly to the Mountain House base area she walks just 220 yards or 5 minutes through a skier parking lot to the Peru and Argentine lifts. Keystone provides red wagons to carry your kids and/or equipment to make that short trip extra easy. The Green Line Bus stops at the entrance of Ironwood Townhouses. Keystone Ski School, rentals and dinning can all be found at the lower Mountain House Base area. The Mountain House Base ski lifts are far less crowded than the well-known River Run gondola and ski lifts. It is a wonderful secrete to keep quiet! 'What big eyes you have...the better to see you with, my dear.' Staying home in the Blue Coyote is a cozy joy with soaring windows and vaulted ceilings that overlook enchanting Snake River and Tenderfoot Mountain vistas. You are steps from Schoolmarm; the longest (3.1 miles) Green Run in North America. You are so near Schoolmarm that you can detour off between Sage Brush, click off your skis and walk across the street to Ironwood. In fact, you can gaze at the Schoolmarm lighted run from the master bed. If you are wearing a bright red hood, you can be seen skiing down the mountain from the Ironwood Townhouses complex! The sounds of the Snake River rushing by can be heard from nearly every room. The Snake runs about 20 yards from our back deck. Ironwood is a 14-unit, quiet townhouse complex that feels delightfully secluded despite the fact it is so close to both the Mountain House and River Run amenities. 'What big Hands You Have...the better to rub together in front of the fire, my dear.' Blue Coyote's guests can sit fireside on nippy nights. Or, guests can choose to take a dip in the private 6-8 person-hot tub to warm up under the falling snow and glistening stars. On a clear night, guests sitting in the hot tub look up to see Ursula Minor (The Little Dipper). The private hot tub is located on the back deck overlooking the Snake River. The hot tub is extraordinarily secluded. 'What big teeth you have...the better to eat you with, my dear.' The Blue Coyote's kitchen is well-equipped with everything from Flour to a Fondue pot. A 5-burner gas range and an outdoor grill make cooking a delight. However, some may rather eat at the world-acclaimed Keystone restaurants, like Alpenglow Stube, The Ranch, Snake River Saloon, Der Fondue Chessel or The Ski Tip Lodge. Our fondest memories are hiking/snow shoeing to a yurt at the Tennessee Pass Cookhouse at Ski Cooper near Leadville (Reservations necessary). Our favorite pizza joint, Pizza 101, is pickup or delivery only and is within walking/biking. Each restaurant is a special and memorable experience. Our favorite activity is road biking...even better than skiing. WE LOVE KEYSTONE AND OUR BLUE COYOTE! We are two business professors that love the outdoors and particularly Colorado. Our puppies have made peace with the many animals in the forests and wetlands around Keystone. We have met the Blue Coyote on two memorable occasions. He is not just a storied beast...he is REAL. Sweet Pea, an 11-year old black Lab mix and Sullivan is a 3-year old crazy man. Our 17-year old a Golden Retriever mix, Fizzy, first met the Blue Coyote on "Granny's Trail," near our townhouse...very fitting. This property fits us perfectly mostly because it is big enough to live in year round without being crowded. Secondly, the convenience to the ski mountain is perfect. And, the Snake River and the bike path are right outside our door! It is our heaven. Surprisingly, in the 14+ years of skiing in CO, we rarely venture out to ski Breck nor Vail because it's just too perfect to walk out our door to the lifts at Mountain House Base in Keystone. It's pretty great to come in for lunch and take a quick nap before skiing the afternoon away. toilet, combination tub/shower, Used for main living floor and MBR #2.
toilet, combination tub/shower, Used for lower living area and bunk room. All bathrooms have undergone major renovations including modern wood tile on the walls, slate tiles on the floors, bronzed plumbing fixtures and lighting. Keystone is not incorporated, however, It is part of Summit County. Ironwood Townhomes are located in a very private/quiet part of Keystone where wildlife like moose, bear and fox are often sited. Keystone Mountain House (1/10 mile), Keystone Village (3/10) and Keystone Lake Village (1 mile). All north facing windows look out to Tenderfoot Mountain. 3rd floor south facing windows look out to the ski area. Single car garage that can accommodate a large SUV such as a Toyota Land Cruiser (one of the tallest SUVs), however it is very tight. There are 2 living rooms. The main living room has vaulted ceilings on the main floor while the 2nd living area is on the 1st floor next to the bunk room. Both French door refrigerator with ice maker and an under-the-counter beverage cooler. Dinnerware for 16, flatware, glassware. Kitchen on 2nd floor (main). Well stocked cabinets, granite, stainless appliances, dinnerware, flatware, glassware, Chicago Cutlery, and new fixtures. Table seats 6. Bar area seats 4. One SmartTV on each floor (3 all together). One DVD Player in the lower living room next to the Bunk Room. We leave books inside the colorful box on the fireplace. Lots of games...too many to list. Vidos are located in the lower living room next to the Bunk Room inside the ottoman. There are wetlands between our deck and the Snake River. Off the dining room there is a balcony overlooking the Snake River. Paddle boards, canoes, and kayaks can be rented in the Frisco, CO marina. Sail boats can be rented in the Frisco, CO marina. Off the downstairs living area next to the Bunk Room there is a larger sized deck with a private hot tub that overlooks the Snake River. There is seating for 6 on the deck for summer gatherings. Storage for skis / snowboards in garage. Keystone also has pay storage for skis in the Mountain House. There is a Tennis Center in Keystone located on HWY 6. Keystone has 2 fantastic golf courses: The River Course and the Ranch Course located just minutes from Ironwood Townhouse. Incredibly private 8-person hot tub on deck overlooking the Snake River. Great location. Close to the lift! Nicely decorated. Very comfortable and well stocked. We thoroughly enjoyed our stay. Beautiful townhouse in a great location! This is a very nice, large space with lots of beds and sleeping options. Close walk out to the lift and even closer to get back in. Nice, large hot tub. Danielle is very helpful and accommodating. You will not be disappointed! Our family of 6 had a great 1-week stay. The property allows easy access to the Peru Lift within about a 5 minute walk. The King bed is very comfortable in the Master Bedroom and all the bedrooms are located on separate floors allowing for good privacy. There is access to various video service (like Netflix) throughout the house which was great. The spa was also really great after skiing. Great place and would highly recommend! Thanks so much for allowing us to stay at such a great place! We were a short walk to the Peru ski lift. So close, we came back home for lunch every day. The kitchen was well stocked with pots, pans, dishes, glasses, and spices (salt, oil etc). 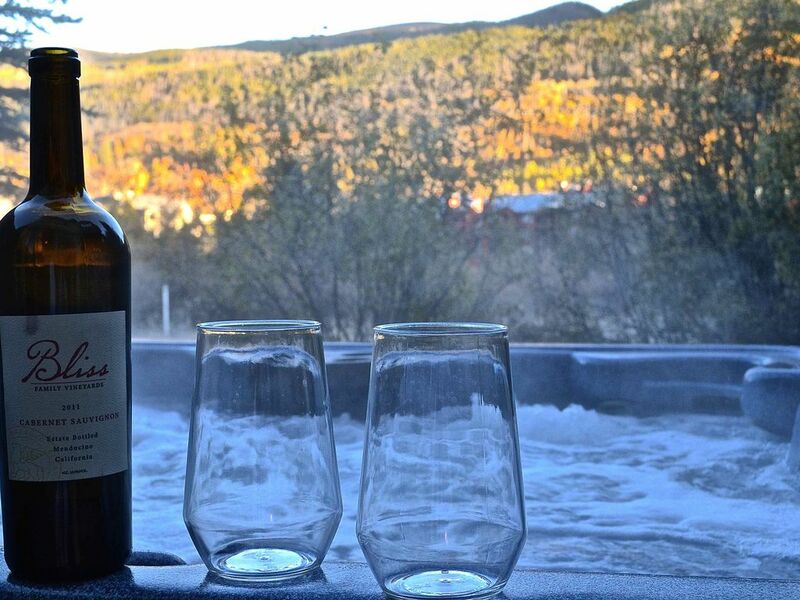 We relaxed in the hot tub after a long day of skiing and played games in front of the fireplace after dinner. It was a perfect slot for 2 families of 5. We would definitely come back again! My husband and I escaped for a quiet weekend in quiet Keystone. We found this condo clean, well appointed and quiet. While there was only two of us, we chose this condo because of location and the private hot tub backing up to the Snake River. It was our first time in Keystone and we thoroughly enjoyed both the Condo and the town! By car, A-Basin is 10 minutes, Breckenridge is 20 minutes, Copper Mountain is 20 minutes, and Vail is 45 minutes.